In the Incredible Drum Show’s first UK run, the Fills Monkey boys don't fail to impress their audience. Sébastien Rambaud and Yann Coste never stop exuding energy during this hyperactive performance, constantly displaying their pretty amazing drumming skills. It might be difficult to envisage a drumming show lasting a full hour; it's normally an instrument that exists within the confines of a band or group. However, Fills Monkey do a good job of keeping the audience's attention. Starting by simply drumming in unison, the pair swiftly drew gasps and laughs from the audience by having a tennis match with drums, playing Summer Nights with just a few brightly coloured batons and only speaking to each other in drumming noises, which the kids (and a fair few of the adults) find hilarious. Rambaud and Coste not only have great musical chemistry (which is especially obvious when they play the same drum kit at the same time) but their comedic chemistry also works well. Constantly arguing and trying to outdo one another on the drums is a perfect recipe for audience laughter. However, it is easy to feel a little let down at the end of the performance. 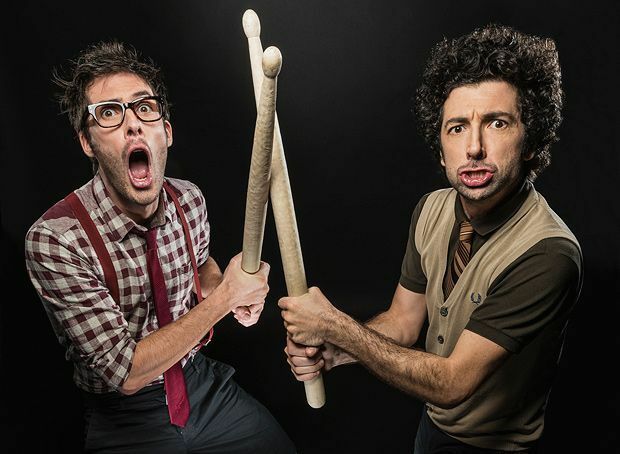 After showcasing original feats of drumming, the pair spend a chunk of time air drumming and playing the air guitar or bass (depending on the song). The audience giggled, but all in all, it was a bit of an anticlimax to an otherwise fun, energetic and entertaining show. Pleasance Courtyard, 556 6550, until 31 Aug (not 25), £10.50–£13.50 (£9–£11.50).